GWINNETT COUNTY, Ga. - It's been one year since former Archer High School football standout Nick Blakely died of a heart attack. 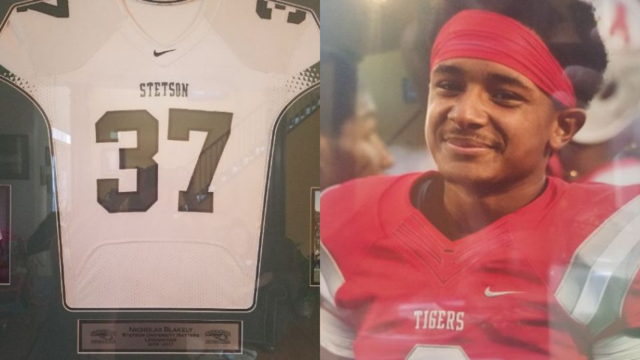 The 19 year old was at football practice at Stetson University when he went into sudden cardiac arrest. "He was a healthy college sophomore with no known prior heart conditions ," Blakely's mom Michelle Wilson said. Wilson said she later learned her son had an enlarged heart. "He had been playing football his whole life and we had no idea," Wilson said. Now Wilson has started a foundation in honor of her son. "I never want another mother to feel the pain I went through, so hopefully this initiative will prevent that from happening," Wilson said. Smiling Hearts: The Nick Blakely Foundation works to raise awareness about the signs of sudden cardiac arrest and what to do in those situations. Wilson said she's also started donating automated external defibrillators to Gwinnett County parks. "Having an AED on site and making it accessible can make the difference in someone's life," Wilson said. Wilson said her foundation will offer free heart screenings to students 12 to 19 years old on Sept. 16. "Nick always said he was going to be famous," Wilson said. "He was right. This is making him famous. He's the face of sudden cardiac arrest and it shows that it can happen to anybody."